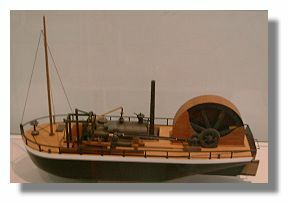 Model of "Charlotte Dundas" the first commercial steamboat in Europe. Many Scots were involved in inventions involving transport. Here are a few of them. Patrick Miller and William Symington sailed the first steam operated boat on a loch near Dumfries (not far from Robert Burns' farm) in 1788. The first practical steamboat was the "Charlotte Dundas" built by William Synington on the river Clyde . A spectator was Robert Fulton who later launched the first practical steamboat in North America on the Hudson River in 1807. The first practical railway was built between Stockton and Darlington in 1825 by George Stephenson who was an Englishman of Scots parents. The first commercial steamboat in Europe was Henry Bell's "Comet" which carried passengers from Glasgow to Greenock in August 1812. Robert Wilson invented the screw propeller in 1827. The first iron steamship in the world, the "Lord Dundas" was built in 1830 by Sir William Fairbairn on the Clyde. The invention of the first pedal cycle is credited to Kirkpatrick Macmillan in 1839. The two-stroke engine was invented by a Glaswegian, Sir Dugald Clerk in 1879. Clerk also built the first gas engine in 1876. The first automobile to be built in Cleveland was made by Alexander Winton who had emigrated penniless from Scotland to America. He later sold his diesel car business to General Motors.